History: This noxious weed is native to Asia, Europe, Africa and Australia. It was brought over to the United States in 1950 from aquariums in Florida. 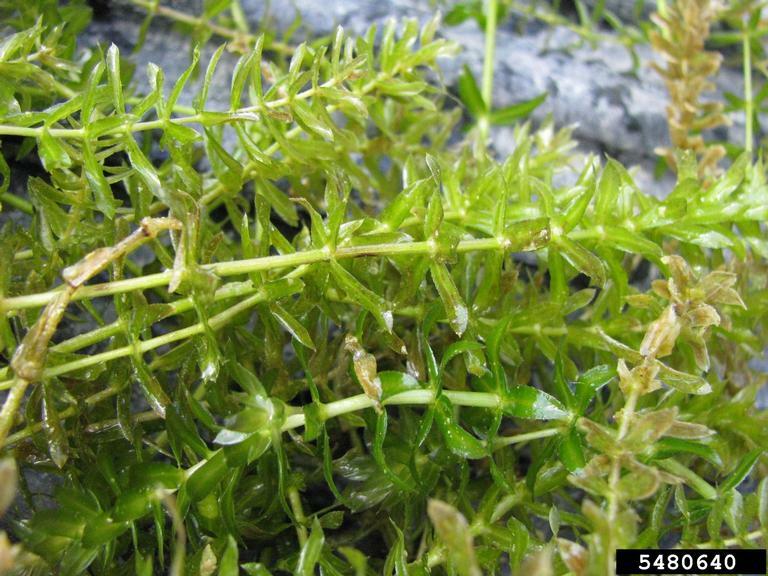 One incident that is recorded in Florida was an aquarium dealer dumped out live hydrilla in Tampa Bay. The first year of control the state of Florida spent nearly 100,000 dollars attempting to control this weed. Now this weed costs millions of dollars every year in control efforts. It is now found in Canada, Connecticut to Texas, and also in California. Roots: On the end of the root this plant produces potato-like tubers and the roots are white in color. Hydrilla in good conditions can grow an inch a day. Stems and Leaves: The stems can grow up to 1-2 meters long and act kind of like a vine. The leaves are arranged in bundles to or 8 around the stem. The midrib is also red in color. Flowers and Seeds: This plant has both male and female flowers that have three petals and three sepals. Most of the time you will not be able to see the flowers. Methods of Reproduction: It mainly reproduces by fragmentation from plant parts off of the main plant. Also it reproduces by rhizomes, which is new plants growing up from the root of another plant. Hydrilla is a herbaceous perennial. Environments Favorable for Infestation: The habitat it prefers is freshwater springs, lakes, marshes, ditches, rivers. Also it can grow in and inch of water and no deeper than 20 feet of water. It can grow in only 1% of sunlight as well. 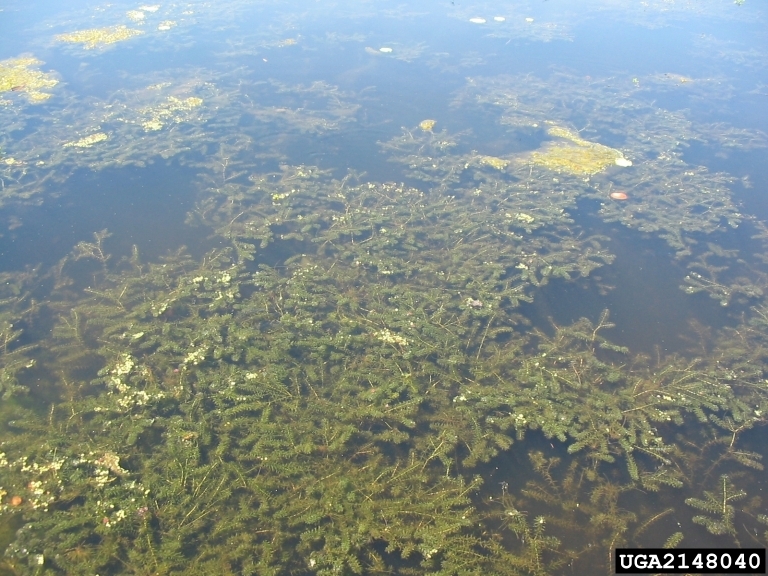 Environmental Impacts: One impact that Hydrilla as on the ecology community in a pond is that it shades out important native plants like pondweed, tape grass, and coontail. Also hydrilla slows down the flow of water and clogs irrigation ditches. Also when hydrilla gets thick it prevents recreation in some lakes as you can not fish or swim in that water without getting tangled in it. Also it creates dense mats that destroy fish and wildlife habitat. It also creates a monoculture and which reduces biodiversity. Prevention: To prevent this noxious weed one thing to do is make sure your boat is clean when transporting from lake to lake. Also the best prevention is to educate people about the negative ecological impacts this plant has on aquatic plant community. Mechanical: One mechanical control is draining the lake where Hydrilla is located, by exposing the plants out of water. Another mechanical control is chopping machines that remove hydrilla from the water. Cutting is not recommended because it will just fragment and cause more plants. Biological: There are weevils that can control this weed with the genus of Bagous. Also there is an Asian leaf-mining fly (Hydrellia pakistanae). Another biological control is the Chinese grass carp which feasts on hydrilla. Chemical: There have been regulations set to only allow fluridone as the only herbicide to control the noxious weeds. "Hydrilla." Wikipedia. Wikimedia Foundation, n.d. Web. 15 June 2016. 2. "Center for Aquatic and Invasive Plants." UFIFAS Center for Aquatic and Invasive Plants. 3. "Hydrilla « AQUAPLANT." Hydrilla « AQUAPLANT. N.p., n.d. Web. 15 June 2016.